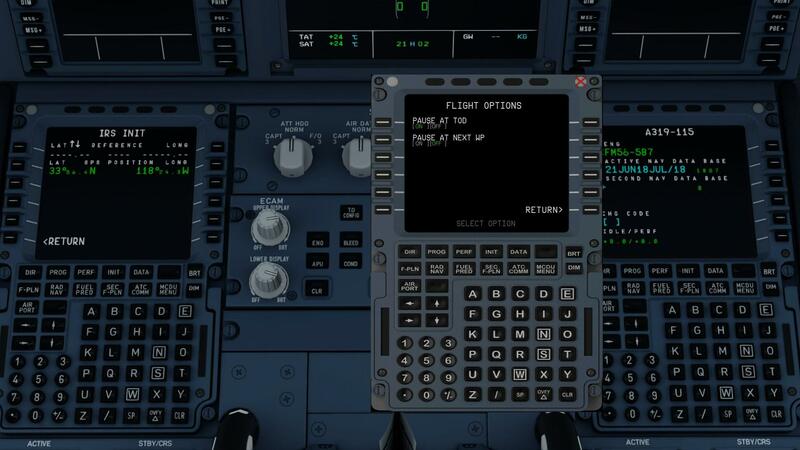 Simple question: I purchased the Airbus a couple days ago and I enabled the "Pause at TOD" feature via the MCDU yet when I attempted a flight, the sim never paused at the TOD. Why is that? Are you sure the option is correct set? Please post a screenshot. Anybody who can confirm this? It seems to work here as advertised. Are you sure you're using 4.3 version of Prepar3D? Not beside the PC at the moment so I cannot test (in work). I can confirm this just happened to me as well. I'm on P3D v4.3, with the latest patch for the 319 (which wiped out my additional liveries from the Aircraft.cfg, btw). With me the break comes about 20NM before TD. In my case, the option works and the sim pauses "well before" TOD (but I'm not sure of the exact distance). Previously, it's always paused 20mi before TOD. However, now, it doesn't pause at all. I let a flight go while I went downstairs. I came back and it was circling over the airport I was supposed to land at, and not paused. I will say it did work before I updated to the latest patch on Wednesday. The same over here. My sim is not pausing at TOD in 80% of all flights. I'm sure that the settings are correct. My sim is pausing at TOD (well, a little before) on every flight I've done so far. For those experiencing this, are you using time compression at any point in the flight? This happened to me today. I was using FSUIPC to autosave the flight so re-ran from before TOD. In the first vid (I hope this works), I had de-selected/re-selected Pause at TOD just prior to the recording, but noticed the aircraft altitude was slightly below the flight plan altitude when it loaded from the saved file(s). I let it go as I was wondering if that was the reason for the lack of Pause. It did not pause at TOD. In the second vid, I pressed the ALT selector to ensure managed mode for altitude (I think that's correct - I'm still learning ) and the bus successfully paused at TOD. I was out of the room when the original flight passed TOD so not sure how things looked but it was still in autopilot flying over KLAS when I got back in the seat. Hope this helps. I have the Save files if your team requires them to re-create the issue.